On-camera flash suffers with a number of problems. It is best to know what you can and cannot do. On-camera flash can be harsh and unforgiving – use sparingly. The flash that comes on-board of most cameras is small, tightly focused and very close to the optical axis of the camera. These things cause problems for your shots. The small size of the on-board flash makes it a source of hard light. While that may be fine for some shots, it creates hard, sharply defined shadows. These are particularly unflattering for faces which makes portrait photography difficult. The light from flashes is coloured to imitate the bright bluish light of a sunny day. That colour gives the face a harshly blue tinge – making a person look like they could do with a couple of good nights sleep! On-board flash is also directly in line with the optical axis of the camera, and it is close to the axis as well. Light that is straight-on like that also tends to flatten the face in the image. Worse still, it is in an ideal position to create red-eye. On-board flash is also quite strong when used close up. This tends to create ugly highlights on the face. These large white spots of light on the cheeks, possibly the chin, nose and forehead, are pretty distracting for the viewer. All these problems add up to pretty unflattering results in portraiture. Happy snappers often don’t realise that they have 100% control over their on-board flash. In fact, most probably only ever use auto-settings. The result? The on-board flash will pop up whenever the camera thinks it is needed. A lot of the time it is not needed or in fact it is a nuisance. While flash is quite strong close up (for portraits say), light falls off pretty rapidly. With light, as you double the distance the illumination reduces to one quarter of its intensity. The tiny on-board flash will therefore have a strong effect close up. In a large room, or a church for example, it will light everything within a few feet very brightly – then everything after that will be black or very dark. That’s because the light does not have much power after a short distance. So, using flash in a dark church for example will have irritatingly bright fittings and people close up, and you will see little else in the background. As an aside, you will also annoy the people nearby who are worshipping or looking around too. In an open space on-board flash can be pretty bad news. What you tend to find is that in darker situations the flash will provide a perimeter of illumination very close to you. This will be a bright glow on the ground in front of you and some illumination of the trees and bushes (or buildings etc) around about. The rest will be black or very dark. In brighter situations, well suffice to say, you get the highlight issues again if there is any shiny surface nearby. Both these cases cause artificial light that spoils the shot. In domestic rooms, smaller spaces and shadows on a brighter day, the on-board flash can be useful if carefully used. However, beware. Any flash in a shadowed place will blow the shadows back in an artificial way. So the charm of the shadowed area is lost where the flash fires. As a result of the bright foreground you also get a deepening of the shadows in the background. This amounts to a pretty contrasty scene. It can therefore look gloomy in your picture. I don’t have a downer on flash. It’s just that on-board flash is very difficult to work with and it is placed in the worst possible place to generate a flash. Ideally I would advise you to buy an off-camera flash. Even moving the flash away from the camera by one arms length removes many of the problems mentioned. Setting the flash to one side, by only several feet, creates its own shadow texture in your shot. This removes much of the blow-out and shadow flattening effect you get when the flash is in-line with, and close to, the optical axis of your camera. I know that many people will say they cannot afford to buy an off-camera flash. Well, maybe so – but some of the unbranded ones are really quite cheap. I have two unbranded off-camera flash units and they are excellent. You have to get used to manual adjustments (which you should be doing anyway), but they are just as effective as branded flash units costing up to ten times more. So, maybe you should be thinking about looking around. Here are some units which I have used. Buy one now and improve your flash photography straight away! Turn it off: This is an improvement because, for example, in a church situation you don’t want to create that deep black pit in the background. Many people don’t realise that you can turn off the flash. If you look in your manual it will tell you how. On many point-and-shoot cameras you can turn off the flash on the screen. 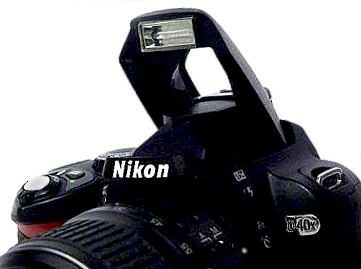 In most DSLRs, its on the screen too. But it may be a button in its own right, or you can find it in the menus. However it is done, the on/off is easy. Then you can take the shot using one of the other settings, or your camera will calculate a longer exposure. The result will be less contrasts, shadows or black areas. If you find you get more camera shake or softness, use a tripod or rest your camera on something. Reduce the power: It may seem odd to reduce the power to get a better shot, but you will gain a lot from controlling the light intensity. In portraiture you will reduce the highlights. Less power will also create less of a blue pallor on faces too. Oddly, a lower power shot will also light the background better. It is the contrast of foreground to background light that causes bright close things and black distance. If you lower the power the contrast will not be so steep. Your camera will choose settings (or you can) that will enable it to see into the background with less dark areas. To reduce the power of your flash look in your manual. It will tell you how to do it. Most flash power settings are available in the menu or on the main control screen of the camera. Most of the time I use the bottom setting. On-board flash is so harsh that I find it is the light touch that is best. There are two more things you can do. One is to use reflectors, or bounce to change your light in some rooms (See: Does Pop-Up Flash Ruin Your Shots?. The other idea is to further diffuse your flash. A quick trick is to tape a piece of white tissue paper lightly in front off your flash lens. I leave a gap to allow air to circulate so it does not overheat. The tissue lowers the power and causes greater diffusion. You will have to experiment to see the effect on your camera. I use this to great effect on my little Canon G12. One possible way to use on-board flash to good effect is as fill-in light. This is a useful way to use your on-board flash, and can be used in conjunction with other off-camera lights. However, it does require practice to get it right. It is almost always used with lower flash power levels too. So it is definitely worth learning how to reduce the flash power. This entry was posted in Camera control, Composition, Equipment, How to..., Light and Lighting, Things to try and tagged Diffuser, Flash, Highlights, light and lighting, Light reflector, Off-camera, Power, Reflector, Tripod. Bookmark the permalink.